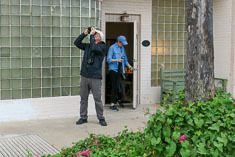 I had suggested a south Texas birding trip to Ed sometime last summer after our trip to North Dakota but didn't think seriously about it until we happened to meet a woman named Mary Beth the day we birded together in Portal last August. 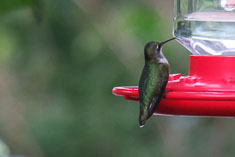 We ran into her while we were waiting for hummingbirds to show up at the feeders at Dave Jasper's old place. 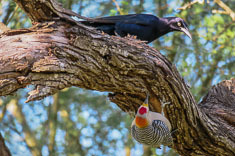 Ed started talking with her and found out she worked at the Alamo Inn, a B&B in the Rio Grande Valley that caters to birders. As they talked, I began to see the trip as a real possibility. 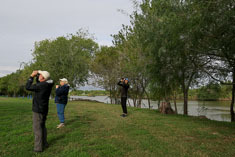 The Rio Grande Birding Festival would take place in early November but the field trips were expensive, and might already be full anyway. For not much more money we could hire a guide for just the two of us. 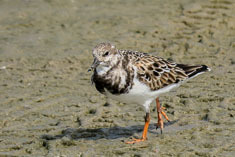 The birds would mostly still be around the week after the festival, and all those birders would already have located the rarities for us. Still, it wasn't until a month ago that I confirmed that Ed was up to the trip and went ahead and booked the travel. Delia would join us for the weekend then Ed and I would stay an additional four days. 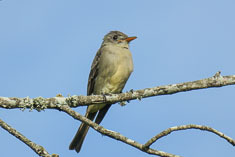 We would hire Mary Beth as a guide for the first two days to show us around and help us learn the local birds than we would explore on our own the rest of the time. Once we had confirmed the arrangements Mary Beth emailed me to request a list of birds we were looking for. 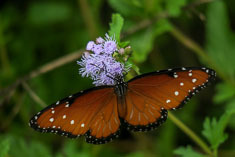 When I finally got around to putting together the list for her, I realized that there were almost two dozen species in the valley that I had never seen. 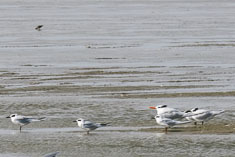 Even if I saw only half of them, that would be more new life birds that I've seen in all three trips so far this summer put together. 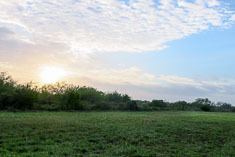 We had expected to arrive at the Alamo Inn in McAllen before sunset but our flight out of Seattle was delayed so we missed the connection at Dallas-Fort Worth. Delia and I count steps so we used the extended layover in Dallas to walk around the airport, getting in bonus steps by going the wrong direction on the walkways and escalators. Getting all the way up a down escalator is no easy feat. Keith graciously met us at the Inn when we finally arrived at 10:30 PM. He showed us around the self-serve kitchen and our three room suite next door. Because a tour group was also staying at the Inn they would be serving a cooked breakfast at 6:30AM. We signed up too. After too short a night, Ed and I made coffee then we all trooped over to the combination store and dining room at the Inn. Breakfast was delicious - whole-grain bread, bright yellow scrambled eggs from someone's backyard chickens, bacon and sausage and grits and fruit - what a great way to start our first day. 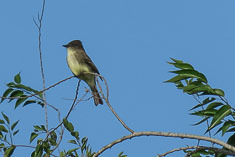 Mary Beth met us at seven but we weren't ready until about 7:30, and then we spent another 15 minutes chasing down a Tropical Kingbird across the street. 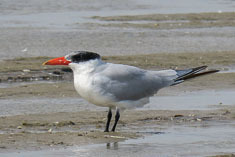 It was our first south Texas specialty but not as special for me since I saw one just two weeks ago in Neah Bay, Washington. Given our interest in photography she suggested Salineño Rd for our first stop. 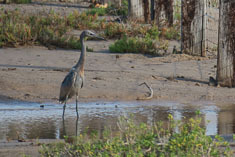 A couple named De Wind (I think) maintains a winter bird feeding station at the end of Salineño Rd down by the Rio Grande a few miles southeast of the Falcon dam. 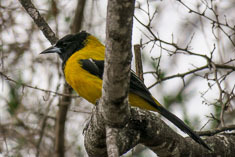 That would be our best chance for Audubon's oriole, Mary Beth told us, and good for Altamira Oriole, Long-billed Thrasher, Clay-colored Thrush and Ringed Kingfisher, all species on my target list. And we'd get good pictures, she assured us. She was right about that. 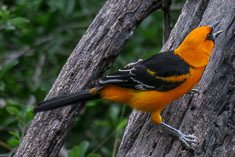 We had great close-up views of the two orioles and the thrasher (all three life birds for me) and of several other valley specialties. 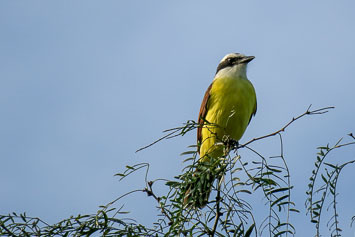 We would see (and hear) Gila Woodpeckers, Green Jays and Great Kiskadees almost everywhere we went but rarely as close-up as we did in the De Wind's backyard. 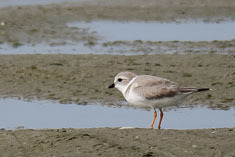 The next three species we later saw at Bentsen State Park as well, which happened to be where I had first seen all three 38 years ago. 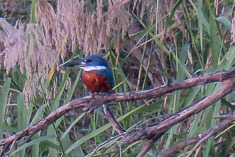 Though we peered up and down the river we did not spot any Ringed Kingfishers. 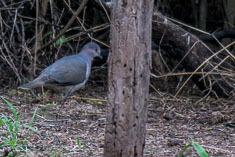 We also missed the Red-billed Pigeons which are reported to roost on the island visible upriver. 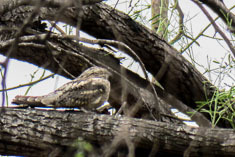 On the other hand we spotted a Zone-tailed Hawk, one of only two for the trip, soaring over the far bank of the river (and therefore over Mexico) and we stumbled across a late Lesser Nighthawk roosting in the mesquite just upstream. 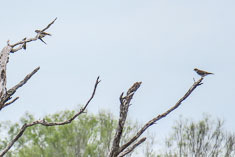 The Nighthawk is a Lesser because it's wingtips barely reach the tip of its tail when it is perched, characteristically lengthwise, on a tree limb. 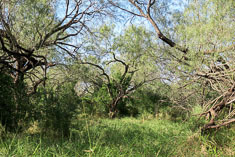 We would have spent more time in the mesquite forest but it had burned last year so there was no undergrowth and therefore few birds. 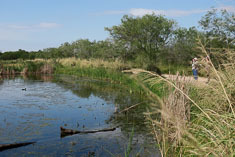 Three men had parked their pickup truck down by the river and were fishing. Though they did not speak much English, they were able to explain that they were fishing for Alligator Gar and they spread their arms wide to show us how big the fish could get. They had not caught any. Ed explained, unnecessarily perhaps, that we were birdwatching. 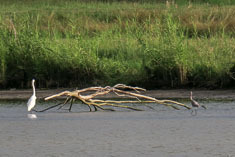 Excited to show off their knowledge of birds, they pointed out the cormorants downstream and a heron fishing upriver. They had not seen any kingfishers as far as we could determine. Though the weather had been dry at Salineño, a factor in our choice to go there first, it was raining as we came back to Rio Grande city. We stopped at Church's Fried Chicken so Mary Beth could get some lunch and while we ate in our fogged-up car, a small flock of Cave Swallows was foraging overhead. I don't think I ever saw one well enough to distinguish it from a Cliff Swallow but both Mary Beth and eBird agreed that Cliff Swallows were much more likely. 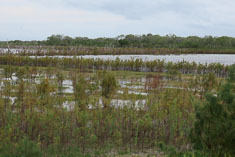 The weather dried out again as we approached Bentsen State Park. 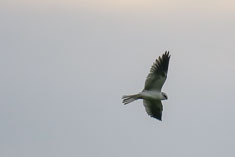 Just outside the park I spotted a White-tailed Kite diving on another hawk which turned out to be my first White-tailed Hawk. To me it looked like a dark phase Harlan's - almost completely dark brown above and below with pale flight feathers and a pale brown tail - but there were three or four of them and on closer inspection we could pick out the small white patch on the chest which made them juvenile White-tails. 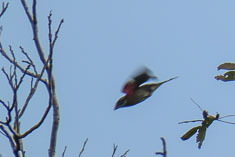 We saw several more in the park including a brief view of an adult overhead. No photo though; I didn't get on it in time. 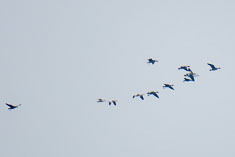 I only got the geese because I already had the camera out after photographing the Mockingbird. That was a very patient bird. It waited while I leaned over, propped my forearms on my knees to grab the camera (hanging from my neck) with both hands, find and press the power button with my ring finger, jerk (as in weightlifting) the camera up to my face, position my index finger sideways on the shutter button, aim, focus and shoot. With all that, my first three shots were out of focus but I finally got a sharp one. 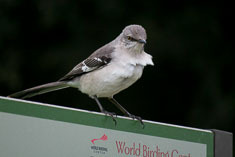 Although not the most common bird of the trip (that would be the Great-tailed grackle), mockingbirds were both the most ubiquitous and most loquacious. Over and over again we would hear another loud and exotic-sounding call and have to remind ourselves, "Oh right, that's a mockingbird." Mary Beth was very helpful with the calls. She pretty much knew them all and saved us a lot of time in not having to track them all down. 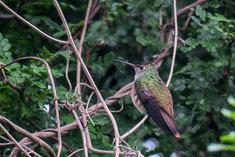 We found both Ruby-throated and Buff-bellied hummingbirds in the garden at the Benson State Park headquarters. 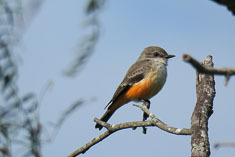 The Buff-bellied was my fifth and last life bird for the day. 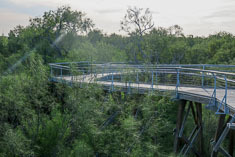 We had hoped to see an Eastern Screech Owl in one of the gnarled trees beyond the restrooms near the Kingfisher overlook but it wasn't there. 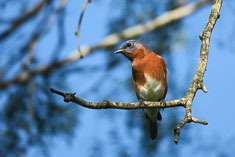 Nor were there any kingfishers at the overlook. 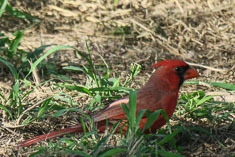 The most exciting birds in the area were two American Robins that Mary Beth picked up by their calls. 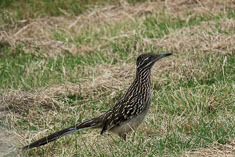 They may be rare in the valley but I still didn't couldn't be bothered to take their picture. 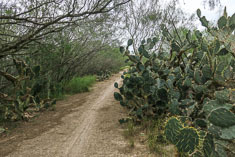 With Mary Beth as our guide again we drove over to Anzalduas County Park this morning in search of a previously reported Greater Peewee which, despite being a summer breeder in southeastern Arizona, would be a life bird for Ed and Delia. 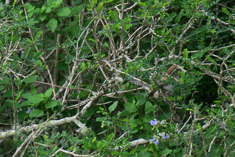 We were also hoping for a Hooked-billed Kite. 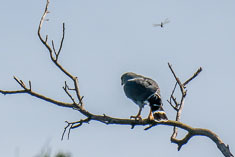 We did not find the kite but we did see our only Broad-winged Hawk of the trip, along with a Swainson's, a Red-tail, two Gray, three Harris's, two Cooper's and a Sharp-shinned Hawk. We also found the peewee. 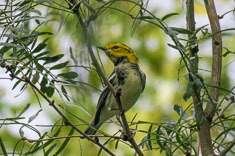 Among the flocks of small birds in the trees we found five species of warblers. 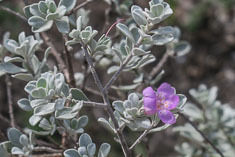 We ended up with a list of 57 species. I was surprised to get such a high count since the park basically consists of 20 acres of mowed lawn with scattered trees. 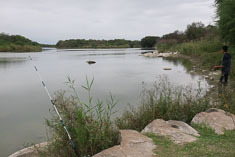 The park fronts on a bend of the Rio Grande immediately above Anzalduas Dam. 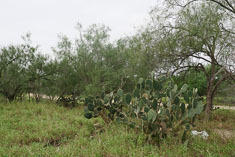 There are good-sized patches of riparian and Mesquite scrub habitat to the north and south but access to those areas is restricted. 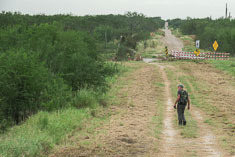 Border patrol agents and police were everywhere in evidence and all the local access roads are off-limits to the public. 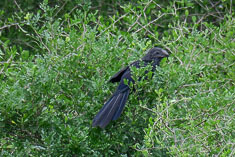 Giving up on the Hook-billed kite, we drove over to Estero Llano Grande State Park to find a previously staked-out Common Pauraque and Groove-billed Ani and to try again for an Eastern Screech Owl. All three would be life birds for me. 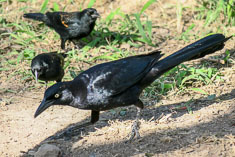 The Groove-billed Ani in particular has intrigued me ever since I saw its picture in my first bird book more than 40 years ago. 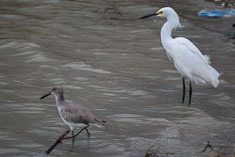 Today I saw it, and the other two species as well. 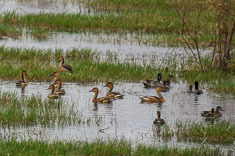 We had a variety of ducks and a nice collection of waders for a total of 61 species. 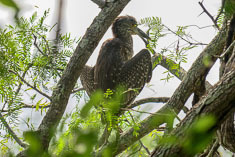 The Pauraque has apparently roosted in the same area (maybe even the same spot) a few feet off the trail by Alligator Lake for several years now. I doubt we would have seen it had not Mary Beth known exactly where it was. 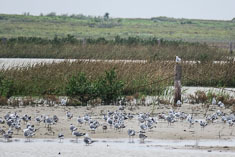 The Anis were flopping around in thickets along the levee as reported on eBird. 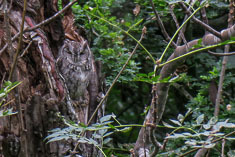 The park host, Huck Hutchens, showed us the Eastern Screech Owl roosting in a snag at the far end of the Tropical Zone drive. 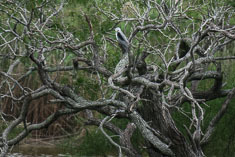 The Night Herons were roosting in trees along Alligator Lake. 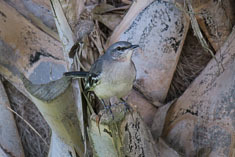 Though the Black-crowned occurs in Washington I hadn't seen a Yellow-crowned since the last visit to Texas 38 years ago. 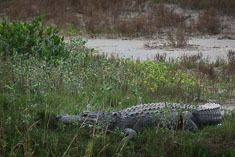 Appropriately there was a big alligator also resting on the shore of Alligator Lake. 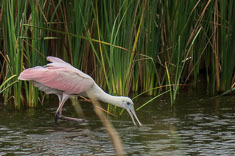 The kite was on the other side of the levee, along with egrets, more herons and even Roseate Spoonbills but all of the waterbirds were too far away for photos. 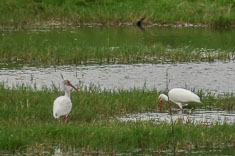 I fared better with the waterbirds in the Ibis Pond as we were returning to the visitor center. 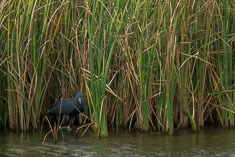 Remarkably there were five different Soras wading around out in the open between the cattails. That is more Soras than I've laid eyes on altogether in my life so far. The light was not ideal for photos but I tried anyhow. 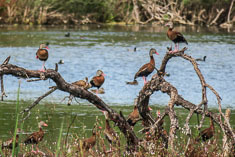 The several Black-bellied Whistling Ducks present gave me my first good look at the species but we didn't find the Fulvous Whistling Ducks reported a couple of days ago. 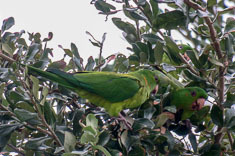 Green parakeets are sufficiently well-established in the area to be officially countable. 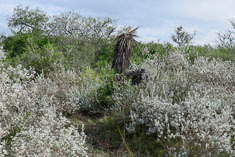 Mary Beth sees or hears them every few days around the Alamo Inn. 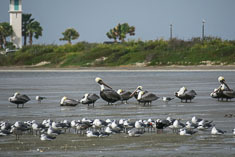 Late this afternoon she took us up North 10th Street in McAllen to look for the flock that roosts in the area. We found them gathered on the wires in the neighborhood of Dove Avenue, a raucous crowd of about 170 of them about an hour before dusk. We pulled into a parking lot, got out and took photos. 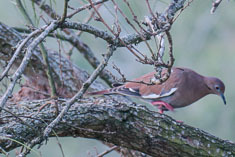 They obliged by flying down to a little oak tree next to our car and foraging for acorns. 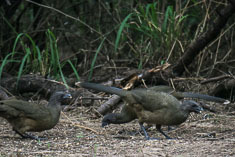 The experience of seeing those sociable birds up close, and Mary Beth's assurance that these were most likely wild birds, completely redeemed their reputation in Ed's eyes. 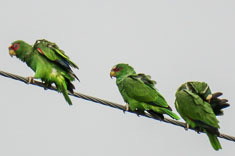 I forgot to mention that we started the day with parakeets too - Monk Parakeets nesting in the town of Hidalgo. I didn't get out of the car in time to get photos of them. 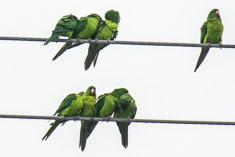 Both parakeet species were life birds which gave me another five for the day. 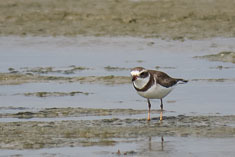 Altogether we had 105 species today and a cumulative total so far of 121 for the trip. Ed and I have a goal to beat 175, the number of species we saw on our Michigan trip last year. We don't think we'll succeed. 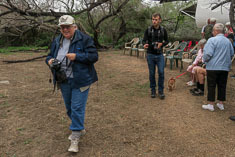 Since we didn't have much time this morning before having to get to the airport to put Delia on a plane back to Seattle, we decided to try Santa Ana refuge just eight miles south of the Alamo Inn. 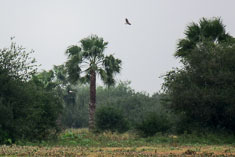 We thought we might find a Hook-billed Kite there. 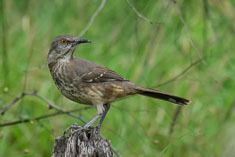 That turned out to be a little too optimistic, but we did see our only Clay-colored Thrush of the trip, a good view near the parking lot along the Malachite trail but unfortunately too brief for a photo. 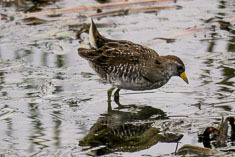 It was an intriguing bird, very much like a robin in appearance and behavior except it was uniformly neutral brown above and slightly lighter brown below. 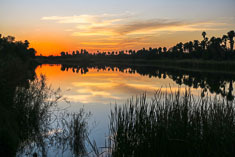 We set out together to take the Pintail Lakes trail but realized when we reached the lakes that we needed a scope so I went back to get it. While I was gone Ed and Delia identified a Ringed Kingfisher in a distant snag but unfortunately it flew before we could get the scope on it. 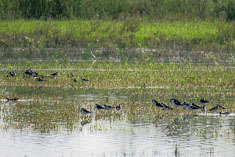 The first lake hosted a flock of Black-necked Stilts and quite a few ducks, mostly Gadwalls, Blue-winged Teal, Mottled Ducks and Northern Shovelers. 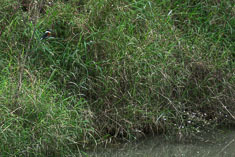 We were more interested in the snag full of Black-bellied Whistling-Ducks along the shore of the third lake. 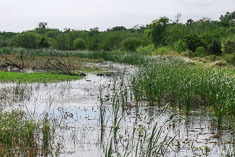 Back along the first lake, waiting for the others to catch up, I heard two rails calling in the cattails along the path. 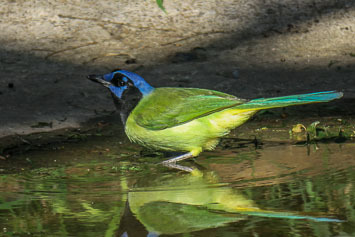 The first bird had a hoarse rapid "kek kek kek" call, usually in series of three but once or twice in longer series. 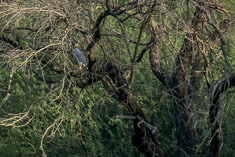 The second bird nearby made single hoarse "keeek" calls. All of the calls were scratchier, lower and less distinct then the Virginia Rail calls that I am familiar with. 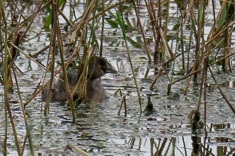 They more closely matched the Clapper Rail calls in Sibley but King Rail would be the expected rail in the freshwater habitat of Santa Ana. 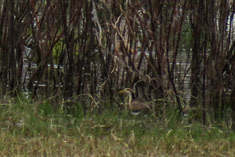 In the end I had to leave them unidentified, but in retrospect I suspect they actually were Virginia Rails. 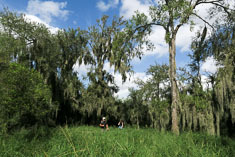 Santa Ana at the only real riparian forest we saw on our trip, tall oaks and other trees festooned with gray "Spanish Moss", with an understory of course tall grass. We only saw the river in a couple of places and it was a good ten feet or more below our ground level. When we reached the hawk watch tower Ed and Delia started to worry about getting to the airport in time so they walked directly back to headquarters while I looped around Willow Lakes. 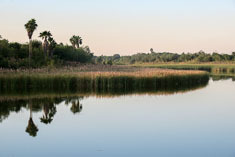 The lakes were mostly dry and there wasn't much bird activity around them. We made it back to the Alamo Inn and on over to the airport in plenty of time. In the afternoon Ed and I went back to Bentsen. 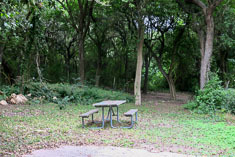 I wanted to find the Tropical Parula which had been hanging around the visitor center, so I stayed in the headquarters area while Ed wandered off down the trails. 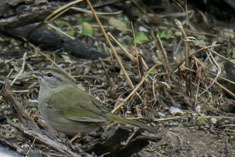 Unable to use binoculars, I found the warbler search quite frustrating. 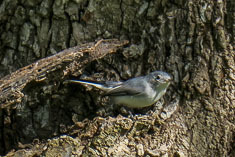 The only small birds I was able to identify in the one mixed flock I found were gnatcatchers and kingbirds and one Orange-crowned Warbler. I didn't get any photos. 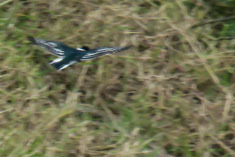 Ed on the other hand got quite close to a Ringed Kingfisher. I was jealous. We ended up back at the Blue Onion for supper because the tamale place we want to go to was closed, as was the Indian place in the same mall as the Blue Onion. On the way down North 23rd we pulled over in a parking lot to search for restaurants on my phone. While we were sitting there we watched a big white SUV hit a cyclist, knocking him into the adjacent lane. The SUV sped off before the cyclist moved but though his bike was trashed, he was able to get up and walk his bike over to his buddies in the parking lot. We were shocked at the hit and run but given our previous experiences with Texas drivers, not surprised. 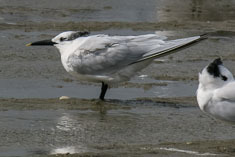 Among the birds I've been looking for this trip and haven't seen yet are two species which I remember from my very first bird book, Singer's Golden Guide. 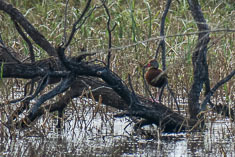 One was an exotic-looking long-toed wader called a Northern Jacana and the other was the other whistling duck, the Fulvous. 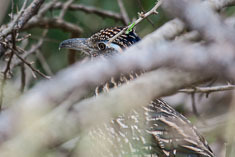 Neither has been consistently reported in eBird recently recently in any location other than Choke Canyon State Park, three hours north of the Alamo Inn. 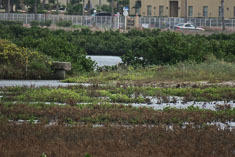 I doubt we would have driven that far for either species by itself, particularly given the likelihood that we would miss it, but with both species being reported yesterday, we decided to go after them. We stopped at sunrise at a rest area a few miles south of Encino and photographed a pair of each other. 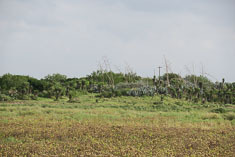 We found both White-tailed and Red-tailed hawks in the same area, open mesquite grassland. 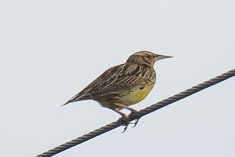 I photographed the Western Meadowlark along the frontage road in Encino. Continuing north, we crossed some dry hills with scrubby brushland about 20 miles south of Three Rivers and found Bewick's Wrens, Pyrrhuloxias and singing White-crowned Sparrows. 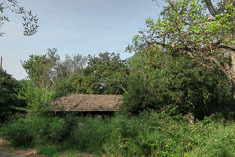 The habitat was quite different from anything we've seen in the valley. Choke Canyon State Park did not disappoint us. 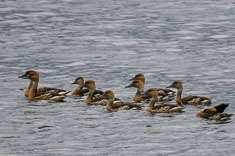 We found the whistling ducks right away; the 75 acre lake was full of them. 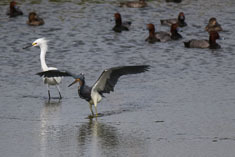 The Northern Jacana was tougher, in part because I looked very hard in the wrong place. A couple from Corpus Christi was leaving just as we arrived. 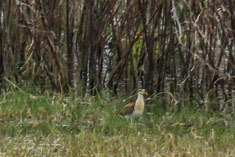 They had seen the Jacana an hour earlier and directed me to look along the grassy far shore of the lake, or so I thought. After I had scoped the far shore for an hour or so a young woman named Nicole arrived. 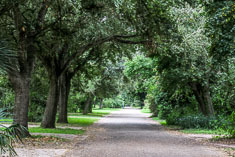 She looked familiar and when Ed struck up a conversation with her we found out that we had met two days earlier at Anzalduas, looking for the peewee. It was she who found the Jacana for us. 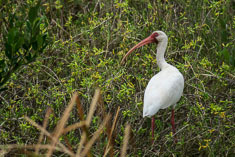 She had also heard about a Whooping Crane hanging out with a flock of Sandhill Cranes outside of Bishop. 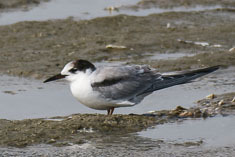 A Mountain Plover had been reported in the area as well. 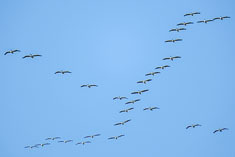 Bishop was more or less on our way home so we followed her down there but found only the Sandhill Cranes, flying overhead at sunset. 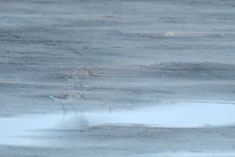 With another hour of daylight we might've been able to find the Mountain Plover. In gratitude for the Jacana (and because she was good company) we took Nicole out for dinner at a local Mexican restaurant. She's doing a big year and the Jacana was #519. It was #508 for me, but Nicole would go on to reach 574 by the end of the year which put her in 15th place for the country in eBird. I would only make it to 528. We hired Mary again to guide us on our trip to the coast. 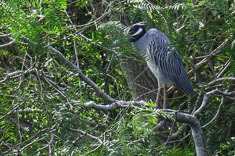 She found us Aplomado Falcons, sleek and dashing birds, along Old Port Isabel Road. 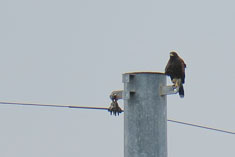 Though they were too far away for photos we had good scope views. 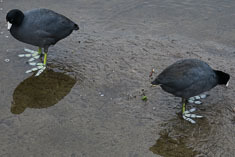 They reminded me of Hobbies in both plumage and conformation. 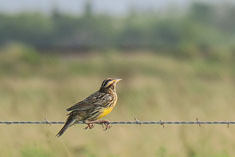 A brisk breeze was sweeping across the marshes, so perhaps the birds on the fence lines were too busy balancing to worry about photographers. Whatever the reason, we had some good photo opportunities (other than the falcons) both there and later in the day on South Padre Island. 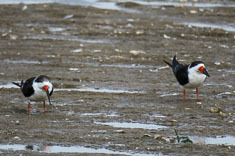 Though we did not find the previously reported American oystercatchers at the Shrimp Basin Bridge on TX48, we did find Black Skimmers there, my second life bird of the day. 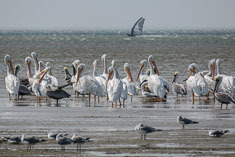 Continuing on to South Padre Island, Mary took us to a small beach just north of the World Birding Center convention center, which in turn is just north of the Audubon Nature Center. The tide was partially out and the sand flat crisscrossed by ORV tracks. 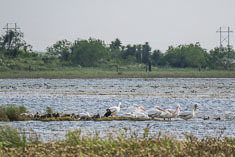 It would have appeared to be an unpromising spot for birds but we had 11 species of shorebirds and 9 species of gulls and terns, plus pelicans, herons and even a Magnificent Frigatebird. Over Ed's objections, we drove around on the sand flat like everyone else and thereby got nice close-up views for photos. 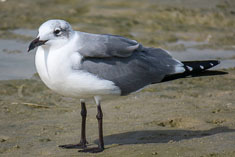 It would appear from these photos that Laughing Gulls come in long and short-legged versions. I do not think that is actually true. 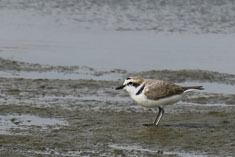 In any case, it was a treat to see all three small plovers at the same time. 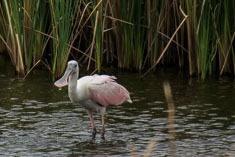 The Audubon nature Center was an amazing place to see waders - herons, egrets, ibises, spoonbills and even my first ever Least Bittern (not pictured). 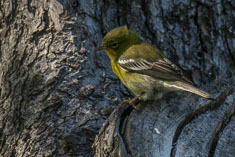 During migration, it's a good spot for songbirds too. We saw three species of warblers including a brief glimpse of a Northern Parula but the fall migration is pretty much over. 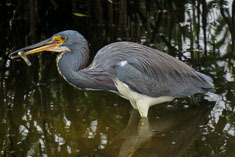 As the photos might imply, most of the large birds were quite tame. 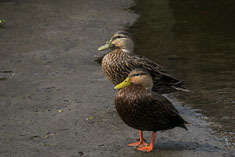 Mottled Ducks are the local version of Mallards. 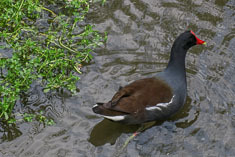 Gallinules and coots are close relatives. 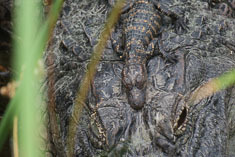 A few alligators frequent the nature center marsh, including a mother with babies. 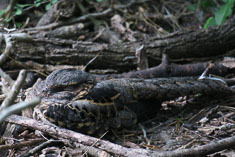 The babies were no more animated than Mom, but maybe it was just nap time. 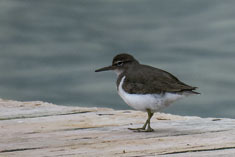 Back at the shrimp bridge, a Spotted Sandpiper had showed up but the American oystercatchers had not. 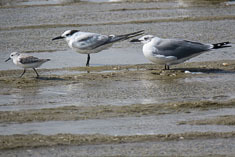 The large flock of Laughing Gulls had been augmented by a few Franklins Gulls, distinguishable by their dusky faces. 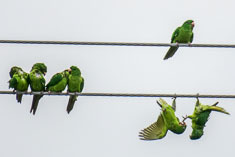 We wrapped up a long day of birding with a stop at Oliveira Park in Brownsville, where hundreds of parrots stage in the eucalyptus trees at dusk before heading into the neighborhood to roost. 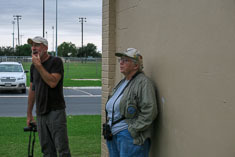 A couple of van loads of birdwatchers also showed up to see the parrots but there were plenty of birds to go around. 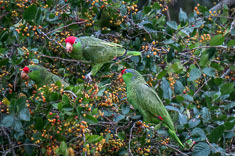 Although the White-fronted Parrots are not yet considered self-sustaining, the local colony of Red-crowned Parrots may now be healthier than the original populations in Mexico from which they were probably derived. 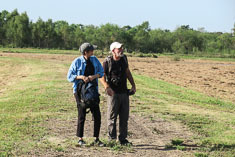 On our own again, Ed and I decided to try again for a Hook-billed Kite at Anzalduas. 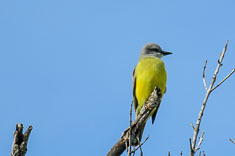 We accumulated a list of 65 species in five hours of birding at the county park but did not see a Hook-billed Kite. 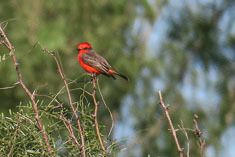 The Greater Peewee was there, and the otherwise rare in the region House Finches. 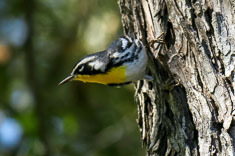 I got photos of three of the six species of warblers present, all three presenting themselves one at a time on the same tree trunk. 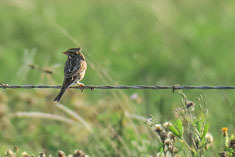 I also decided to brave the chiggers and traipsed across the field by the entrance, flushing Sprague's Pipits and both species of Meadowlark. Things were pretty quiet at the visitor center at Bentsen State Park. 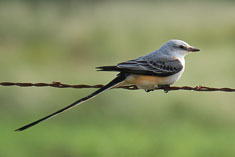 I photographed an uncharacteristically inconspicuous Mockingbird but wasn't able to get a picture of the brilliant Hooded Oriole nearby. 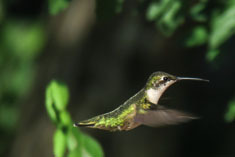 A Ruby-throated Hummingbird was hanging around the feeder and I heard a Buff-bellied nearby but couldn't find it. 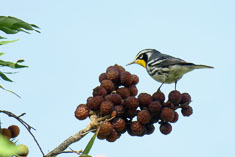 The small bird flock with which the Tropical Parula had last been reported was not around. Hoping that the Ringed Kingfisher Ed saw on our previous visit would show up again at Kingfisher Overlook, we headed out that way. 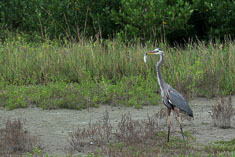 Of course it was not there but I enjoyed taking photos at a couple of the nearby feeding stations. 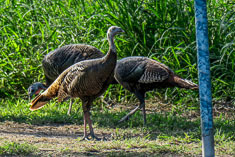 The Wild Turkeys were new for the trip. Grey Hawks seemed to be everywhere. 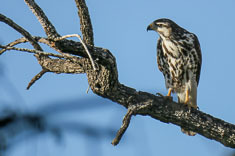 Ed noted that they appear to be the southwestern version of a Broad-winged Hawk. 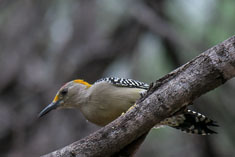 I wanted to get a good close-up photo of an adult but had to settle for this distant shot in a tree and a back-lit back view. A couple of guys on the shuttle bus had urged us not to miss the Hawk Watch Tower so we made the trip out there. 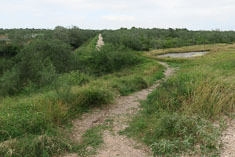 As we approached we flushed a Red-shouldered Hawk and as usual, I did not get a good look at it. 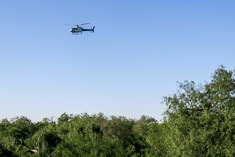 As soon as we got up on the tower a border patrol helicopter began circling around the area quite low over the treetops. Annoyed by the noise we gave him the finger and he immediately turned and made straight for us, veering off a hundred yards or so before he reached us, but after that he left us alone. Other than Grey Hawks we didn't see much from the tower but agreed we would recommend it nonetheless. 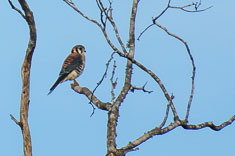 We caught the last shuttle back towards the visitors center and the driver graciously stopped so we could all photograph an American kestrel. 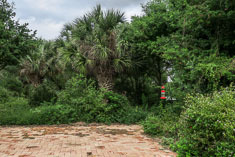 Ed continued on the shuttle but I got off and walked because I wanted to swing by the Kingfisher Overlook one more time. The sun was getting low. Two Great Horned Owls began to call. 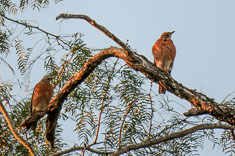 I photographed the two robins, locally rare, that we had seen on our first visit. Still seeking Ed's Ringed Kingfisher I searched along the slough and it was there. I got a photo for proof. On our last day we returned to Estero Llano Grande in pursuit of the Tropical Parula reported the day before in the Tropical Zone section of the park. 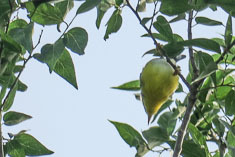 It was still there, foraging in the treetops with a flock of other warblers, gnatcatchers and titmice. Our views weren't great but were sufficient to identify it. 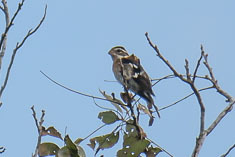 We also relocated a previously-reported juvenile male Rose-breasted Grosbeak. Before we left Ed found our first Nashville Warbler of the trip to bring our total species count up to 199. 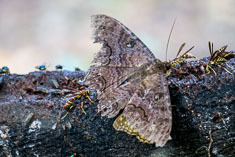 We met Huck on the way out and he showed us the Black Witch Moth, one of the largest moths found in North America, though it is primarily tropical. 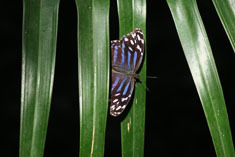 The Mexican Bluewing I found while Ed was talking with Huck. Ed had seen one earlier but this was my first. 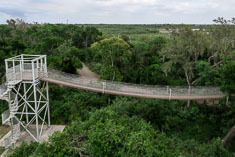 When we told Huck (or maybe it was one of the other naturalists at the visitors center) that we were still looking for a Hook-billed Kite, he suggested that we try the Mission Nature Park near the airport. 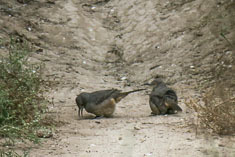 The kites feed on the tree snails which are common in the mesquite forest in the park. 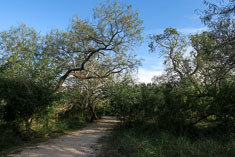 The Mission Nature Park turned out to be a patch of mesquite woodland laced with mountain bike trails. 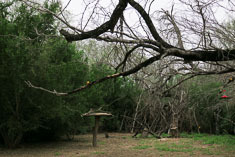 The mesquite wooodland extends more or less to both Bentsen-Rio Grande Valley State Park and to Anzalduas Park so it's easy to see how the Hook-billed Kites could commute to the area to feed. 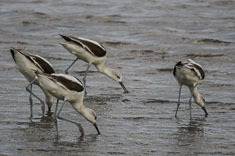 We did not find any kites but we did pick up three more trip birds to boost our total just barely over 200. 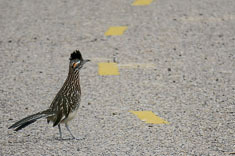 We followed a dike out from the parking lot, flushing a couple of Roadrunners. 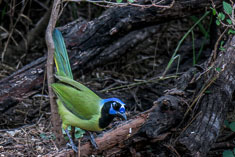 They seem to prefer the dry mesquite woodland habitat. 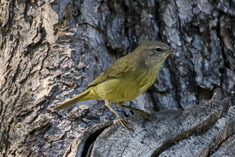 I heard a Bell's Vireo, recognizing its song from last July in Big Bend National Park where it also frequents mesquite, but the bird was some distance away and we didn't see it. 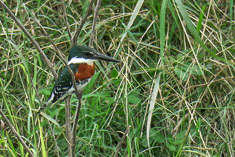 We did see a Green Kingfisher, unintentionally chasing it along a grassy irrigation channel. It was the best view I've had of the species. I also glimpsed a couple of sparrows but didn't get a good look until we were almost back to the parking lot again. 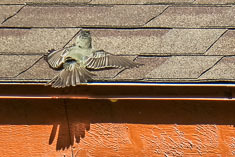 They were Cassin's Sparrows, distinctively nondescript. I was too close to the one I saw well to get a photo. 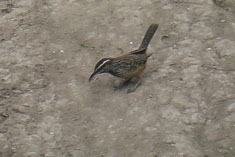 That was not the case with the Cactus Wren; in fact I did not even know we had seen one until I was reviewing my photos during the flight home. 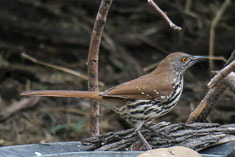 I had just assumed it was another Curve-billed Thrasher. 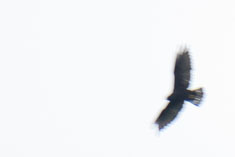 I had to include a photo of a Harris Hawk, even though I obviously did not succeed in getting a good one. 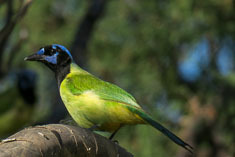 We saw quite a few during our trip and they are beautiful birds. 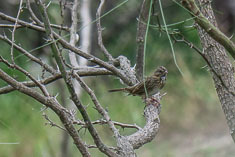 The Lincoln Sparrow and Pyrrhuloxia were my last couple of sightings in the park and for the trip. 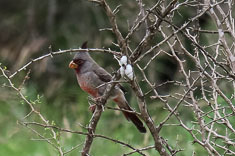 The Pyrrhuloxia photo was my first and only good view of that species. Anxious about getting to the airport in time, Ed had already turned to go back to the car. After photographing the Pyrrhuloxia I decided to follow suit, which was a good thing because it was a longer walk back to the car than I expected. I ended the trip with 19 new life birds, exceeding my most optimistic projections. 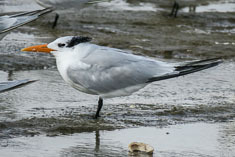 The only life bird I expected to see but missed was the American Oystercatcher. 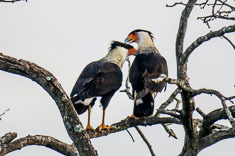 The Hook-billed Kite was a big miss as well but I hadn't expected to see it to begin with. 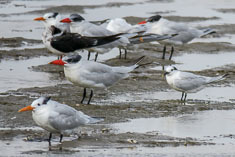 For the trip I had 202 species, the most I've ever seen on a single birding trip. The Alamo Inn was a perfect place to stay and I was very happy with our decision to hire Mary Beth as our guide for three days. Ed was great company, as always. 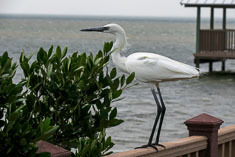 His chronic pessimism and occasional anxiety alternately kept me grounded and provided comic relief, but he is also excellent at spotting birds, better than he thinks he is at identifying them by sound, and has enough common sense to realize that a timely end to birding today will enable us to get out as early as we want to tomorrow - something I occasionally forget. 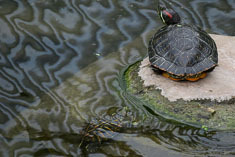 Regarding the photos, I took them all with a Canon G3X. It's remarkably good for a compact super-zoom and light enough that I can still use it. I'm grateful for that. 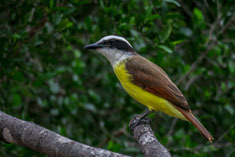 Here's a list of the 202 species of birds that I saw or heard during the trip.